Wow,seems like it was a let down for you.That should be considered a blessing with all the new releases popping up all the time!I can't wait to sample these! Interesting that you and V. split on this and Nuit Noire. I will just have to wait for my samples--which should be coming any year now--and see for myself. I ordered Abinoams too; I wonder if they were planning to start a sample program anyway, or if all our questions made them do it:) Ah, the power of the blog! My sampels took 14 days to get here, I hope yours arrive soon. And then please do let me know what you think. Thanks for he review! This is the one I'm most interested in. But indolic is not my thing. So maybe if it passes quickly. We'll see. Otherwise it sounds very nice. It passes very quickly. So there is a good chance you might liek Carnation! This is a shame. 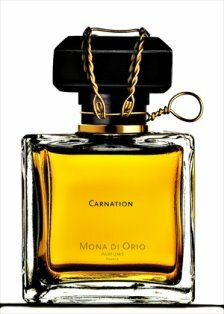 I love carnation, and I had great hopes for this one, but sounds like it's definitely not in that spicy carnation mold at all. Well, the beginning was verye xciting, "dirty" and spicy and all good things at once...and then...lovely but...not spicy and not really caranation. oddly enough, when i tried this it smelled distinctly like leather in the top note, and i got amber and gardenia in the middle. it's a great composition, in a lot of ways, but i agree the end of the drydown seems pale compared to the first hour. I am so glad someone shares my affection for Nuit Noire. :-) I agree about the name though, if only because there are too many Nuits and too many Noir(e)s already. Better late than never... I am SO bummed about this. I was really looking forward to it. Am rethinking ordering those samples after all, this is the one I was most excited about. This post inspired today's post for me (I was gone this weekend.) Thanks for breaking the bad news to me, though.